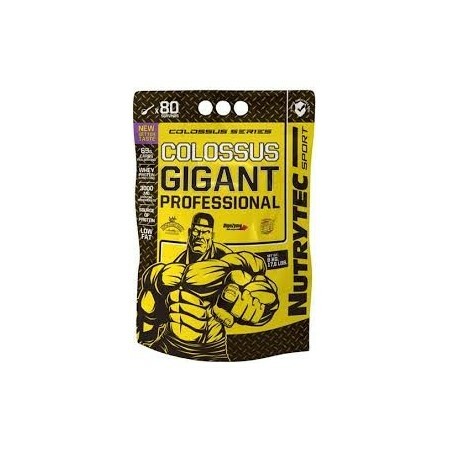 Gigant Nutrytec Colossus is a volumizer that helps you to gain weight with a good balance of high quality carbohydrates and whey protein concentrate, BCAA Creatine glutamine. 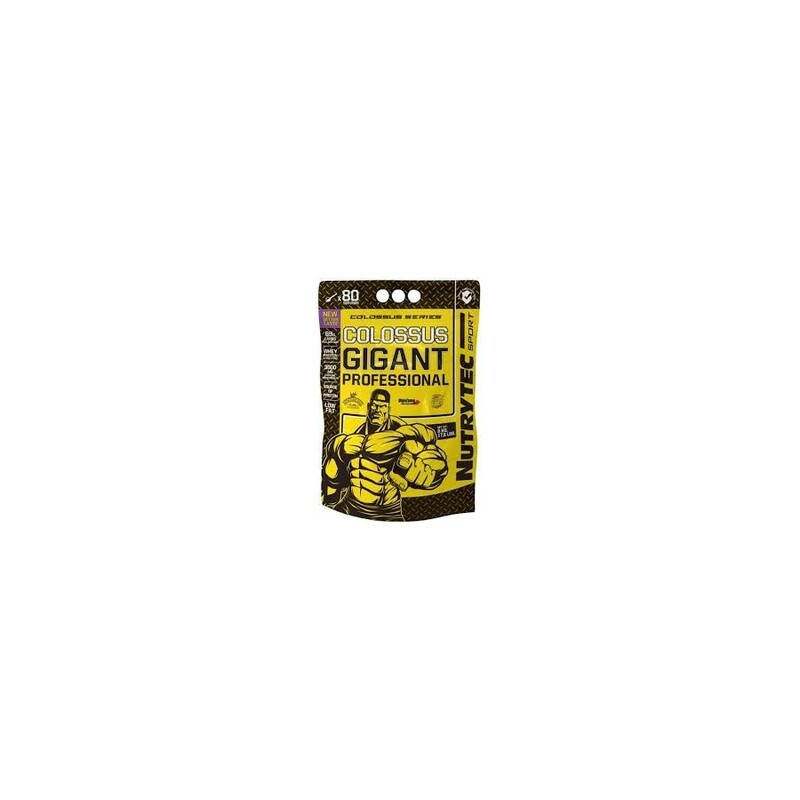 It has whey protein concentrate of high quality with a good balance of high concentrations of amino acids glutamine and BCAA, with maximum uptake and absorption in the muscles. Dextrose a powerful carbohydrate that helps energy balance in the body. With great mobilizing glycemic index creatine into the muscle. Oatmeal is a carbohydrate with a large índiceglucémico reinforced with protein, minerals, magnesium, calcium and vitamins. Oatmeal is one of the most complete by its energy and nutritional qualities cereals. One reason that creatine choose is determined by the soluble and it is difficult to absorb and transported to the muscles Malic acid was charged by enhancing the availability of energy production in muscle tissue. Creatine is needed to improve the musculature in order to grow and more force element. Chocolate ingredients: Dextrose, Oatmeal, whey protein concentrate, cocoa powder, creatine monohydrate, chocolate flavoring, soy lecithin, saccharin E-954, E-955 sucralose, sodium chloride and vitamin B6. Strawberry Ingredients: Dextrose, Oatmeal, whey protein concentrate, creatine monohydrate, strawberry powder, strawberry flavor, soya lecithin, yoghurt powder, citric acid, saccharin E-954, E-955 sucralose, sodium chloride, vitamin B6 and E-122 dye. Hazelnuts Ingredients Vanilla: Dextrose, Oatmeal, whey protein concentrate, creatine monohydrate, soy lecithin, vanilla flavor, yoghurt powder, cream flavor, hazelnut flavor, saccharin E-954, E-955 sucralose, sodium chloride and vitamin B6. Cookies & cream Ingredients: Dextrose, Oatmeal, whey protein concentrate, creatine monohydrate, soy lecithin, graham cracker flavor, yoghurt powder, cream flavor, saccharin E-954, E-955 sucralose, sodium chloride and Vitamin B6. Tropical ingredients: Dextrose, Oatmeal, whey protein concentrate, creatine monohydrate, soy lecithin, pineapple flavor, passion fruit flavor, coconut flavor, yoghurt powder, banana flavor, Saccharin E-954, E sucralose 955, sodium chloride, vitamin B6 and E-110 dye. Take 100 grams of product mixed with liquid (water or skimmed milk). Depending on your lean muscle mass and your nutritional needs, take 1-3 servings daily.